To get from Kings Cross to Euston I have a number of options, but given that my train ticket includes an Underground journey, I'm thinking that either walking (fast!) or tube would be my best bet. Given the tight connection, I'm after the fastest way to do it. What would that be? Based on this 3D model of Kings Cross / St Pancras underground station, I see that none of the underground lines are that close to the Northern Ticket hall where my later train will come into. At the Euston end, I know that Euston Square station is quite a fair way from Euston station itself, which the Victoria or Northern Lines are quite deep so there'd be walking + escalators to get up to the surface (plus the long walk+escalator at the KX end to get to them). Walking wise, not sure which is the quickest way to go, but I suspect it wouldn't necessarily be the "obvious" one along Euston Road. So, which is the quickest way - tube (if so which) or fast walk (if so which way)? Travel in the frontmost carriage if you can; that'll put you closest to the ticket barriers at Kings Cross. Get up and go to the doors as the train approaches the station. You want to get ahead of the crowd (you don't want to get stuck in a massive queue for the ticket gates when you're in a rush). When you get to Kings Cross, go to the Departures Concourse, head for platforms 9-11, and go out of the doors you'll find right by them. Cross Pancras Road outside there (there's a crossing to the right, past the taxi rank). You'll get across much faster at that part of the road than at the end where it meets Euston Road. Enter St Pancras through the big glass doors and walk straight through, taking a path parallel to Euston Road. You'll come out on Midland Road. Cross that straight away too. Now turn left and head towards Euston Road. The British Library's on your right as you approach Euston Road, and you can cut through its courtyard if you like; it won't save you much time but it's pretty and uncrowded. Stick to Euston Road for the rest of the journey. Don't use the tube. If you need to use public transport, there are buses which should be quicker than the tube, but I would recommend walking unless you have a mobility problem or a lot of luggage. 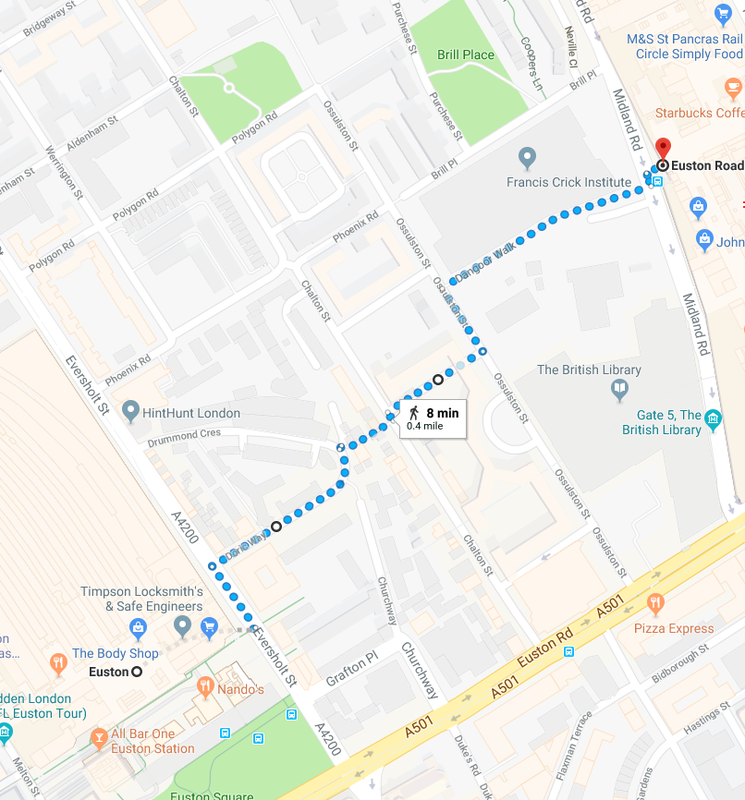 There is an alternative route by going through St Pancras Station, out via the Midland Road exit and turn right to go along Brill Place/ Phoenix Road (alongside the Francis Crick Institute) and then left along Eversholt Street. It's slightly farther, but it's quieter. Euston Road's pavement (sidewalk) is quite narrow and is often busy. You can get slowed down by other pedestrians along there, particularly if you're trying to rush. Brill Place is quiet enough that you can just walk along the roadway if someone blocks the pavement. Note that Churchway is literally an alley and the path between Chalton Street and Ossulston Street on this route passes between the backs of people's houses. Last time I did this route (in summer), I literally walked underneath people's washing lines. Walk it! I studied at UCL (just over the road from Euston) and lived near Kings Cross. As long as there are no mobility issues, there's no way I would recommend using public transport between the two stations. You'll walk past the British Library, too, which is worth seeing. You'll end up walking almost as far underground, down escalators, corridors, along platforms at Kings X, then the same coming out at Euston as you would walking above ground, and without the need to wait for a tube train :) Walk straight along Euston road. It will take you 5 minutes max. If you walk fast then I would definitely say that walk will be faster. Just follow the main road (Euston Road) just like Google Maps suggests, I don't think there are any reasonable shortcuts. I didn't really time this, but I would expect about 10-12 mins from platform to platform. Just adding an up to date comment that the route given by Richard Gadsden (copied below) definitely works as I just walked it in less than 10 minutes with a suitcase at a good pace. Definitely the fastest between these two stations ever! Especially amazing if going to/coming from KGX Platforms 9-11. Note that crossing between Chalton and Ossulston St requires cutting through a courtyard which is gated at both ends so there will be times of day this is closed. Just go down to the next street to cross. Not the answer you're looking for? Browse other questions tagged trains public-transport london or ask your own question. Is there a website that tells me the quickest way between two London Tube stations?